Windows မွာ Defrag လုပ္ဖို႔ Built-in ပါလာၿပီးသားပါ.. ဒါေပမယ့္ ကိုယ့္ HDD ပမာဏ သိပ္ႀကီးေနတယ္၊ ဖိုင္ေတြကလည္းမ်ားတယ္ဆိုရင္ built-in Dfrag နဲ႔ ၾကာပါတယ္.. အဲဒီအတြက္ IObit Smart Defrag က ျမန္ျမန္ဆန္ဆန္နဲ႔ အဆင္အေျပဆံုး ကူညီေပးသြားမွာျဖစ္ပါတယ္.. Defrag လုပ္တယ္ဆိုတာက ကၽြန္ေတာ္တို႔ေတြ ေန႔စဥ္ကြန္ပ်ဴတာကိုအသံုးျပဳၾကတဲ့အခါ System ဖိုင္ေတြမွာ သူ႔ေနရာနဲ႔သူ အစီအစဥ္တက်မရွိ၊ Data ေတြကို ဖ်က္လိုက္/သိမ္လိုက္နဲ႔ အစီအစဥ္တက်မရွိတာေတြကို အစီအစဥ္တက် ျပန္လည္ စီေပးတာျဖစ္ပါတယ္.. လုပ္ငန္းခြင္မွာ အလုပ္လုပ္ၾကတဲ့အခါ ကိုယ့္ပစၥည္းေတြ ေနရာတက်မရွိတဲ့အတြက္ ကိုယ့္ပစၥည္းေတြကို သူ႔ေနရာနဲ႔သူ ေနရာတက် စီစဥ္ေပးတာနဲ႔တူပါတယ္..
Windows မှာ Defrag လုပ်ဖို့ Built-in ပါလာပြီးသားပါ.. ဒါပေမယ့် ကိုယ့် HDD ပမာဏ သိပ်ကြီးနေတယ်၊ ဖိုင်တွေကလည်းများတယ်ဆိုရင် built-in Dfrag နဲ့ ကြာပါတယ်.. အဲဒီအတွက် IObit Smart Defrag က မြန်မြန်ဆန်ဆန်နဲ့ အဆင်အပြေဆုံး ကူညီပေးသွားမှာဖြစ်ပါတယ်.. Defrag လုပ်တယ်ဆိုတာက ကျွန်တော်တို့တွေ နေ့စဉ်ကွန်ပျူတာကိုအသုံးပြုကြတဲ့အခါ System ဖိုင်တွေမှာ သူ့နေရာနဲ့သူ အစီအစဉ်တကျမရှိ၊ Data တွေကို ဖျက်လိုက်/သိမ်လိုက်နဲ့ အစီအစဉ်တကျမရှိတာတွေကို အစီအစဉ်တကျ ပြန်လည် စီပေးတာဖြစ်ပါတယ်.. လုပ်ငန်းခွင်မှာ အလုပ်လုပ်ကြတဲ့အခါ ကိုယ့်ပစ္စည်းတွေ နေရာတကျမရှိတဲ့အတွက် ကိုယ့်ပစ္စည်းတွေကို သူ့နေရာနဲ့သူ နေရာတကျ စီစဉ်ပေးတာနဲ့တူပါတယ်..
IObit Smart Defrag Pro is a popular, efficient and award-winning disk defragmenter that provides extremely fast and efficient defragmentation to your hard drives intelligently for faster file loading and high disk performance. 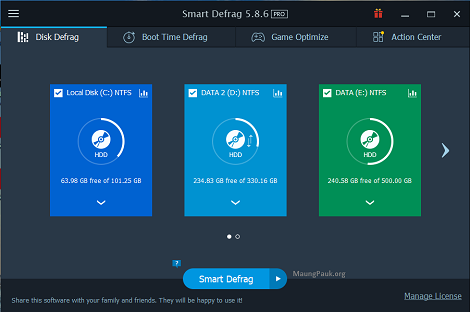 With the new generation of ultra-fast defrag engine, Smart Defrag 5 can not only defragment users’ HDD but also trim SSD to accelerate disk read/write speed and enhance disk durability. 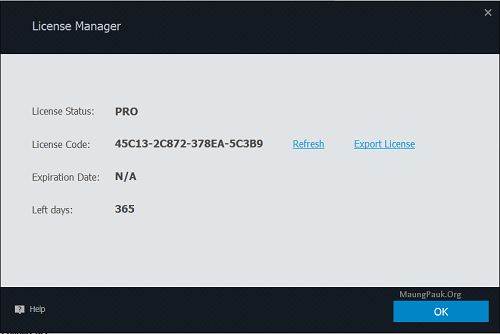 Users can easily defrag large files and consolidate free spaces with the newly added Large File Defrag and Free Space Defrag for more efficient defragmentation.